Dupilumab (Dupixent) for Asthma | The Medical Letter, Inc.
CLINICAL STUDIES — FDA approval of dupilumab for the new indication was based on the results of 3 randomized, double-blind, placebo-controlled trials in about 2800 patients >12 years old with uncontrolled persistent asthma. 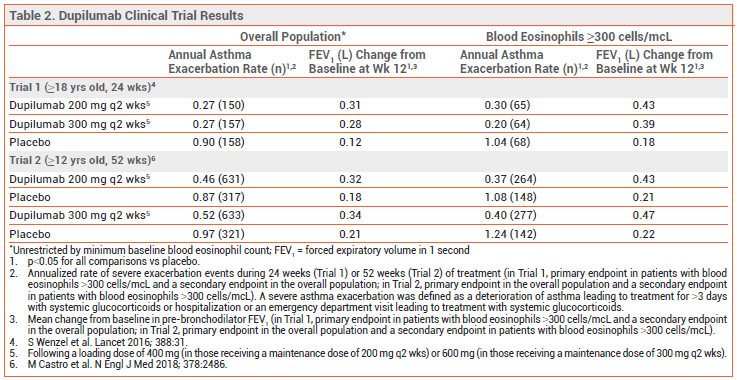 Trials 1 and 2 enrolled patients who were receiving medium to high doses of inhaled corticosteroids plus 1 or 2 additional asthma-controller medications. Addition of dupilumab was associated with statistically significant increases in FEV1 and decreases in severe asthma exacerbations compared to placebo. Dupilumab was effective irrespective of baseline blood eosinophil counts, but patients with higher eosinophil counts at baseline improved more.7,8 The results are summarized in Table 2. ADVERSE EFFECTS – In asthma clinical trials, the most common adverse effect of either dose of dupilumab was injection-site reactions (14-18%). Transient eosinophilia can occur during treatment; blood eosinophil counts ≥3,000 cells/mcL were reported in 2% of patients treated with dupilumab in trials 1 and 2 and in 13% of those treated with the drug in trial 3 (the higher rate in trial 3 may have been related to oral corticosteroid dose reductions). Eosinophilic pneumonia and vasculitis consistent with eosinophilic granulomatosis with polyangiitis have been reported in adults receiving dupilumab; a causal relationship has not been established. Conjunctivitis has been reported in patients treated with dupilumab for atopic dermatitis. Anaphylaxis occurred in one patient treated with dupilumab for asthma. DRUG INTERACTIONS — Use of live vaccines should be avoided in patients being treated with dupilumab. PREGNANCY AND LACTATION — Available data from case reports of dupilumab use in pregnant women have not shown a drug-associated risk of major birth defects or adverse maternal or fetal outcomes. No adverse developmental effects were observed in the offspring of pregnant monkeys who received up to 10 times the maximum recommended human dose of another antibody against the IL-4 receptor alpha subunit. Whether dupilumab is present in human breast milk is unknown, but human IgG is secreted in breast milk. There are no data on the effects of the drug on the breastfed infant or milk production. ADMINISTRATION — Dupilumab is injected subcutaneously into the thigh, abdomen, or upper arm. Patients or caregivers can be trained to administer the drug at home. CONCLUSION — Add-on maintenance treatment with dupilumab (Dupixent) can improve lung function and reduce severe exacerbations and oral corticosteroid use in patients >12 years old with moderate to severe asthma, particularly those with an eosinophilic phenotype. How dupilumab compares to the other monoclonal antibodies that are approved for treatment of eosinophilic asthma remains to be determined, and its long-term safety is unknown. Dupilumab (Dupixent) for moderate to severe atopic dermatitis. Med Lett Drugs Ther 2017; 59:64. S Wenzel et al. Dupilumab in persistent asthma with elevated eosinophil levels. N Engl J Med 2013; 368:2455. Benralizumab (Fasenra) for severe eosinophilic asthma. Med Lett Drugs Ther 2018; 60:33. S Wenzel et al. Dupilumab efficacy and safety in adults with uncontrolled persistent asthma despite use of medium-to-high-dose inhaled corticosteroids plus a long-acting β2 agonist: a randomised double-blind placebo-controlled pivotal phase 2b dose-ranging trial. Lancet 2016; 388:31. M Castro et al. Dupilumab efficacy and safety in moderate-to-severe uncontrolled asthma. N Engl J Med 2018; 378:2486. KF Rabe et al. Efficacy and safety of dupilumab in glucocorticoid-dependent severe asthma. N Engl J Med 2018; 378:2475.